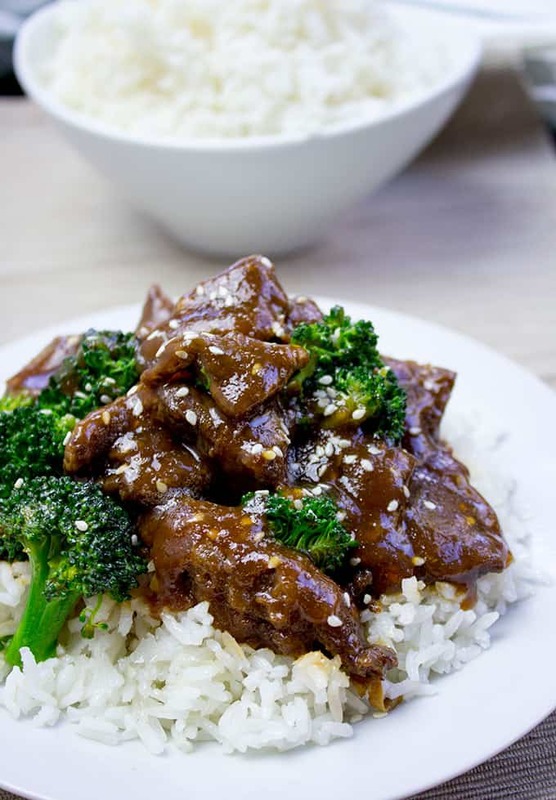 Garlic Hunan Beef is a spicy stir fried beef with garlic, ginger and thai chilies, this dish is one of the most popular on menus in Chinese Restaurants. 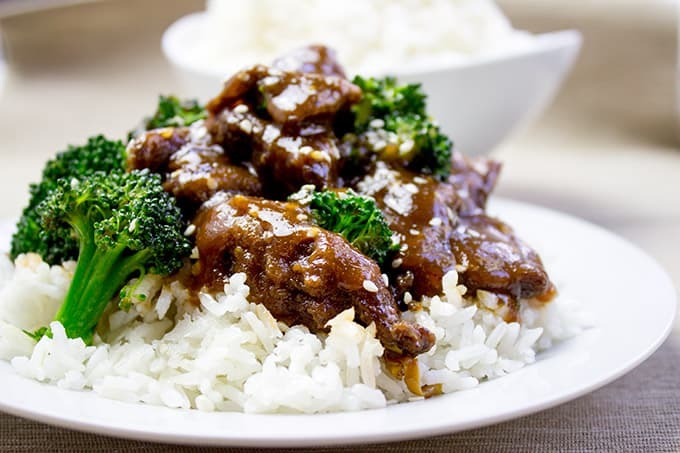 Garlic Hunan Beef is one of the dishes I grew up ordering as a kid when we would go to get Chinese food at the amazing Chinese restaurant in town. You may recognize it as Panda Express, but at the time they had not yet launched the fast food arm of the company and they were still just Panda Inn. Panda Inn (which still exists, it just isn’t nearly as good as it used to be) was one of the most popular restaurants in town next to Tony Roma’s (see my Tony Roma’s BBQ Chicken, Onion Loaf and Cole Slaw) and we used to wait hours to get a table. Ordering food was so much fun, the menu was so big, the dishes would be put on a lazy susan and when you finished your meal you’d get a fortune cookie dipped in white chocolate and wrapped in brightly colored foil. No two item plates here, each dish was a work of art. 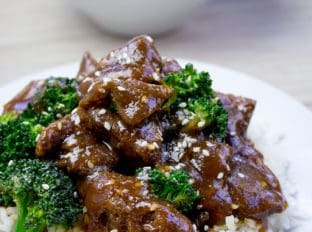 Garlic Hunan Beef is spicy dish with dried Thai chilies, coarsely ground black pepper (please do not use normal black pepper you would otherwise have in a pepper shaker, it will completely ruin the dish and blow out your taste buds), ginger, garlic and Chinese wine. 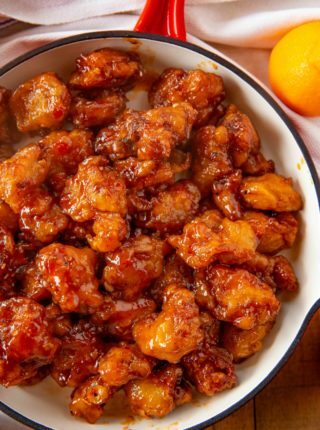 This dish in addition to other Chinese food dishes like Spicy Tangerine Beef with Carrot Ribbons, Spicy Cashew Chicken, Orange Peel Chicken and all the Panda Express copycats all benefit from the use of a wok. I know you probably think you won’t get a lot of use from a wok, but once you buy it you’ll find yourself looking for more recipes just to use it! I find woks are amazing for quick, high temperature stir-fries. It also helps you make large quantities of food quickly since the depth and size of the pan allows for quick tossing. Moral of the story, woks are awesome. 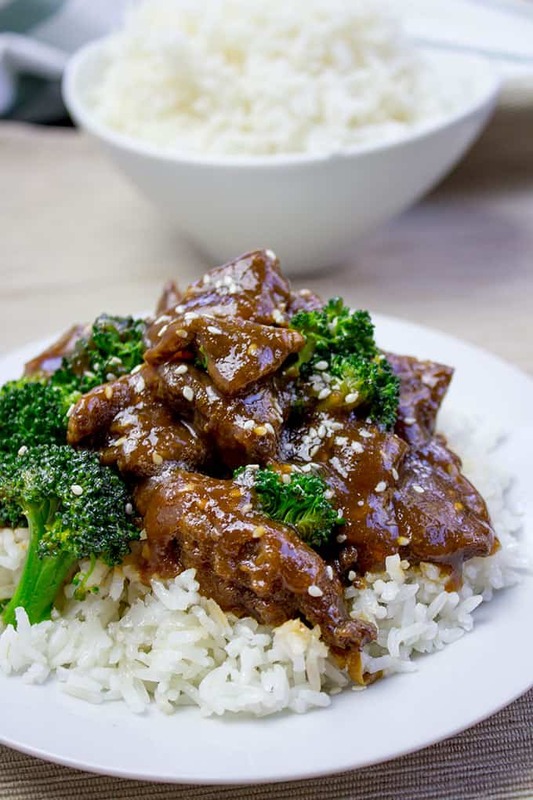 Garlic Hunan Beef is a spicy stir fried beef with garlic, ginger and thai chilies, this dish is one of the most popular Chinese food dishes you'd order at your favorite authentic restaurant. 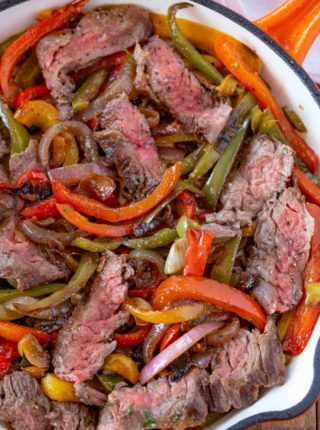 In a large ziploc bag add the steak, garlic, ginger, soy sauce, black pepper, wine, chiles, and cornstarch. Marinate for at least two hours, I recommend overnight. Heat your wok on high and add the canola oil. Remove the beef from the marinade (reserve the marinade) and add to the wok. Cook the beef for 30 second on each side until caramelized. Add in the reserved marinade and stir to combine until thickened, 15-30 seconds. Serve immediately with steamed broccoli and rice. I have the meat marinating but, I’m using flat iron steak…it’s very similar recipe to ginger beef. I’m going use white onions instead…dry heat..no oil…then ginger green beans on the side. This came out well although I made a few mistakes. I tripled the recipe because I had 3 lbs of frozen flank steak from Costco and didn’t want to re freeze any. I sliced it thin while it was semi frozen and marinated it. When I went to cook it, I put all of it in the wok. It would have been better cooked in batches. Also the meat hadn’t completely thawed so it made sort of a soupy sauce. I used snow peas because I didn’t have broccoli. Next time I will follow the recipe exactly, but my version was still very good. Oh yes, slicing when frozen is great but you want to be sure it thaws and isn’t wet when you marinade since that is a lot of extra water. Also cooking in one big batch steamed the meat instead of searing it. Glad you still enjoyed it though! Garlic. That’s all I need to know. I love it in anything and everything, and this will fit the bill nicely! You sound like a woman after my own heart! This looks so amazing, I want to lick my screen! I should not look at food posts this late at night! 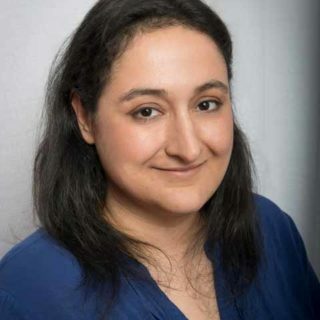 Thanks, Aimee! I fall into the same trap with late-night blog surfing too! This looks so delicious. I know what I am going to make for dinner this weekend. Thanks for the great recipe. Thanks! Come back and let me know how you liked it! I have never tried this dish before. It looks delicious and easy to make. My family is going to love it. Thanks, Ann! I hope you enjoy it! YUM! It looks like beef and broccoli with a KICK! I might have to make this for dinner this weekend! THANK YOU! Thanks! I really like my Chinese food spicy! Yes! The original! Super expensive though. I wouldn’t be able to choose between Tony Roma’s and Panda Inn. 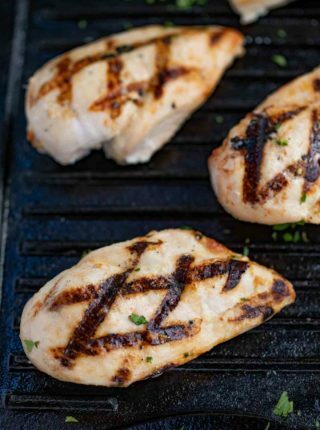 This recipe looks so much like the one at Panda Inn. Very cool. I love Chinese. This looks so delicious. I look forward to giving it a try. Thanks, Stacie! I hope you do try it! 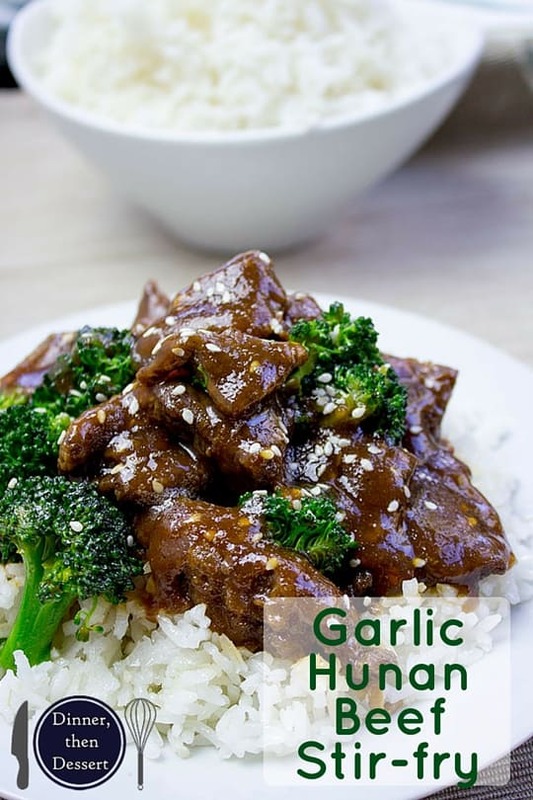 I have always loved garlic Hunan beef. There is a restaurant here called Best China that makes a great version. It is out of the way though so I need to try making my own. It never hurts to have a good Chinese food recipe under your belt! This recipe looks amazing! 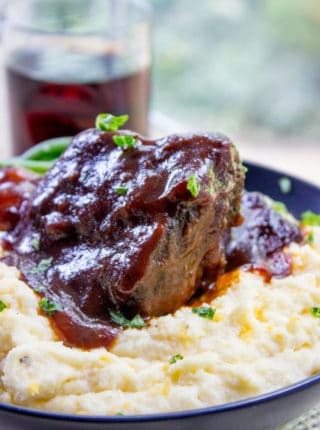 I would love this for dinner, I would love to make this! I love making Chinese food at home!! This looks so good perfect for a family dinner! I’ve never been to Panda Inn, but this looks much better than Panda Express. Bravo! That looks amazing. I love dishes like these. Anything with veggies and rice is what I love. Of course I love that it’s healthier too. I agree – any dish that starts with veggies and rice is headed in the right direction! This recipe looks really tasty! I would love to try it the next time I get this cut of beef. I’ve never used a wok but just looking at this dish makes me want to run out and buy one. Thanks for the inspiration! Thanks! I want my kitchen to be fully stocked for any possible recipe, so I’ve always had a wok on hand! Anything with garlic is a safe bet with me. I love garlic I throw it in just about everything. I will have to try this recipe. Garlic is one of my favorites too! Oh, my, goodness. This looks BETTER than at the restaurant. Pinned this one to try later. Quick question – where do you find that wine? I’ve seen it in a few authentic Chinese recipes but haven’t looked for it or stumbled across it in stores. can I Use Serling Steak ? I’m not quite sure what Serling steak is but if it’s tender enough, you can definitely use it. Just make sure to cut against the grain. Enjoy!